I took Serts out for another short ride with the Easyboots yesterday. 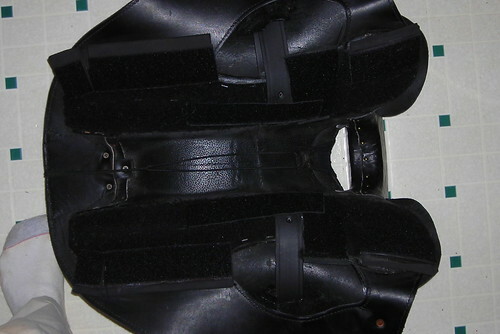 I put some old comfort pads in the bottom of the boot. They were Tanna's, so cut a little too small, but Serts seemed much more willing to move out and to canter this time, so I think I might end up getting comfort pads for him. However, I do think the boots are just too long, so I've ordered size 2 comfort straps to see if those will help the boot fit better. Today I was able to ride a 20+ mile training ride up and down hills. I met my good friend, Angie and her horse Sabre at a campground a good distance from my house. The trail was new and we were scoping out the trail system, so our ride time was about 5 hours. A good long time in the saddle, although not as fast as an endurance ride. I used my Specialized saddle with the endurance-sized Woolback pad. The shims were set up in the following manner. The only change from the below picture is that the rear shims were shifted away from the spine 1/4". Tanna did well on the trail. After our ride, I checked many times after the ride for back soreness and he never showed one problem on his back or his sides. The ride was not as fast as an endurance ride or as long, however, I am cautiously optimistic with this shim set up.